The prophet Haggai urges for work to begin on the new temple. WHEN ZERUBBABEL ANDhis company came to Jerusalem they did not begin at once to rebuild the temple of the Lord. Winter was coming on, and first they built houses for themselves. But at the return of springtime they set to work at the great task that had brought them back to Judah. Zerubbabel and Jeshua, the high priest, hired carpenters and masons for the new building, and put to work every man among their number who was twenty years old or more. Again they sent to the Lebanon Mountains for wood to use in the building, for Cyrus the king had given them permission to do this. These strangers were Samaritans, the people who came to live in Israel after the northern tribes were carried away into captivity. These were the people who had mixed religion–a mixture of the true religion and idol-worship. 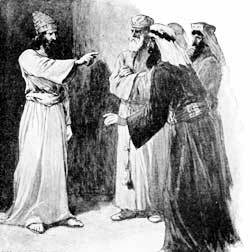 When Zerubbabel and Jeshua refused to let them help build the temple they grew angry and tried to hinder the work.